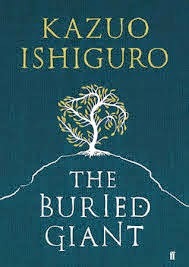 I've read most of Ishiguro's novels and enjoyed them immensely. The films of the books have been excellent too. This new one absolutely joins the parade. It's marvellous. In fact there are a lot of old, malingering people in this book, including the two central characters Beatrice and Axl, who are absolutely delightful. Their love for each other is the central charm of the book. Like all the characters Ishiguro has them talking in a stilted, formal English. It's very theatrical and Elizabethan, often beautifully poetic with Shakespearean elegance. The Saxons and the Britons have been at war in the ex-Roman colony of Britannia but are now at peace, albeit a fragile one. It is guarded and cherished by the old and wise. Deep roots of hatred and vengeance lie buried - the Giant in the title - but threaten to break out at any time. There are a few subplots running through the narrative, which are interesting in themselves, but the real power of this well told story is the journey Axl and Beatrice take, on foot, over a few days, up hill and down dale, to meet up with their lost son - who may or may not be real or alive. There is even a Name of the Rose moment when they visit a monastery full of mysterious, plotting monks.